The Full Moon in Leo was a total lunar eclipse and a SuperMoon. If the Moon had risen above the horizon in your location at the time of the eclipse, you were able to see a big red Moon. The media was advertising a Blue Moon. The term has no astrological significance and refers only to the fact that this was the second Full Moon in January. This was a super powerful Moon. A lunar eclipse is considered more powerful than an ordinary Full Moon and so is a SuperMoon. The Moon’s orbit is elliptical, and when the Moon at the time of a Full Moon or a New Moon happens to be at perigee (the point of least distance) it is called a SuperMoon. Even the astronomers are using this term nowadays, but originally the term was launched by astrologer Richard Nolle in the 70’s. The Full Moon in Leo was in exact conjunction with asteroid 1 Ceres, the very first asteroid to be discovered. Ceres was originally classified as a planet, and later downgraded to an asteroid. Now it is one of the dwarf planets and the only one in that category orbiting the Sun in the main asteroid belt. Ceres was discovered in 1801 by Giuseppe Piazzi. Recent studies suggest that Ceres possibly has a layer of liquid water in its interior, and also water in the form of ice everywhere on its surface. There is a strong possibility that life on Earth originated from Ceres. Piazzi didn’t know about these hypotheses when, in the early years of the 19th century, he proposed the name after the Roman goddess Ceres, Mother Earth. In Roman mythology Ceres had a daughter, Proserpina, whom she loved dearly. One day Pluto abducted young Proserpina and made her the queen of the Underworld. Ceres desperately searched her daughter everywhere, but she couldn’t find her. In her grief and anger Ceres stopped the growth of fruits and vegetables. Jupiter sent Mercury to free Proserpina. Pluto made Proserpina eat six pomegranate seeds, because those who ate food of the dead could not return to the world of the living. Therefore every year Proserpina has to spend six months with Pluto. This is wintertime on Earth. The other six months she is allowed to live with her mother Ceres. When Proserpina returns, Ceres allows plants grow and flowers bloom again. The myth describes the change of the seasons, and nature’s eternal cycle of renewal. February 2 is Candlemas, one of the Christian holidays. The name refers to candles that are blessed on this day for use throughout the year. Originally in the ancient Rome this festival was feasted in honor of Pluto and Ceres. The Romans walked through the city with lighted candles, because Ceres sought her daughter Proserpina in the night with the light of a candle. Also the Celtic pagan festival Imbolc is feasted around this time, halfway between the winter solstice and the vernal equinox. 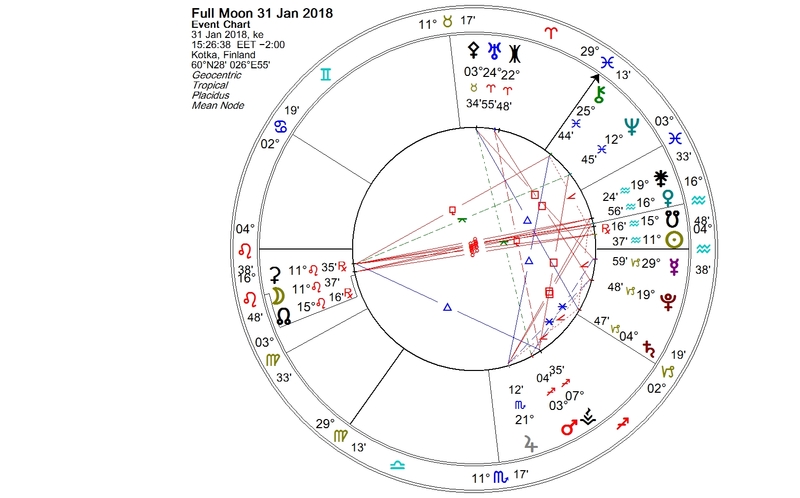 In the Leo Full Moon chart we have a tight conjunction of two astrological symbols representing mother, the Moon and Ceres. Unconditional love, grief, nurturing and taking care of others, food-related issues and sharing are among the themes of Ceres. In “Asteroid Goddesses” Demetra George ponders Ceres’ rulership in signs, and introduces Ceres as the ruler of Cancer, Virgo and the Taurus-Scorpio polarity. She mentions that Ceres, in her Virgoan expression, symbolizes workers, labor unions and strikes, among other things. On February 2 a massive political demonstration takes place in Helsinki. Finland’s largest labor organization, the SAK, is protesting the so-called “active model”, the government’s program to reduce the benefits of the unemployed. Thousands of workers will gather to show their solidarity with the unemployed. For instance, the bus and metro workers, and many branches of the public sector will be striking. The delivery of meals to daycare centers may be disturbed, and parents have been advised to pack some food along with their children on Friday. Several themes of Ceres can be recognized concerning Friday’s events. You are currently browsing the Lunations by Kirsti Melto weblog archives for February, 2018.